It’s the age old debate, one that has been battled nearly to the death since the dawn of time. Alright, maybe not that extreme, but people have gone back and forth between hardwood flooring and laminate for a long time. These are the surfaces that we so often encounter, though perhaps never really consider—until deciding on what our home needs. Undoubtedly, there are benefits to both, and advantages that one can bring that the other lacks. In this two-part blog, Rolla’s flooring experts at The Flooring Nook will examine both types of flooring today to figure out the best option for you. Today’s edition will focus on the benefits and the drawbacks to hardwood flooring. Our literal brick and mortar store is the place for you to get the design guidance you need, as well as the flooring installation service to take your home projects to the next level. From hardwood flooring, laminate options, to cabinets, we’ve got you covered (and your home, too). Learn about the pros and cons of installing hardwood flooring, and contact The Flooring Nook today to get started! The amount of force that needs to be exerted towards a tree to make any kind of impact serves as a good reminder of hardwood flooring’s durability. Unless you see yourself taking a chainsaw to your hardwood flooring, this is an option that is built to last. In fact, the oldest basketball court in the world was built with hardwood flooring in 1895 in a Paris YMCA, and it’s reported to still be in “near-perfect condition” 122 years later. If a gym can handle footsteps, dribbling, and decades of draining threes, it’s safe to say that in your home’s lifetime, your hardwood floor will last. The durability of a hardwood floor practically speaks for itself, and is highly advantageous to having it installed in your home. Something that many people love about hardwood flooring is how it can be modified to fit the trends over time. This is an important distinguishing factor from laminate flooring. With laminate, you would get it installed, and then any changes you’d wish to make later would have to require an entire stripping of the floor. The design you choose for laminate is probably relevant now, but in 10-12 years, it might be outdated and in need of a change. Especially if you’re looking to renovate your kitchen, dining room, or other space, this often requires having flooring that matches. In the case of laminate flooring, it’s hard to keep up without tearing everything apart and starting over. Hardwood flooring, on the other hand, can be refinished and stained within a day or two, with the existing wood remaining intact. This process buffs out any scratches, and brings in a fresh stain in any number of shades or hues to stay up-to-date, both with the room itself and trends as a whole. Once you have hardwood flooring, any modifications can be relatively easy to complete. 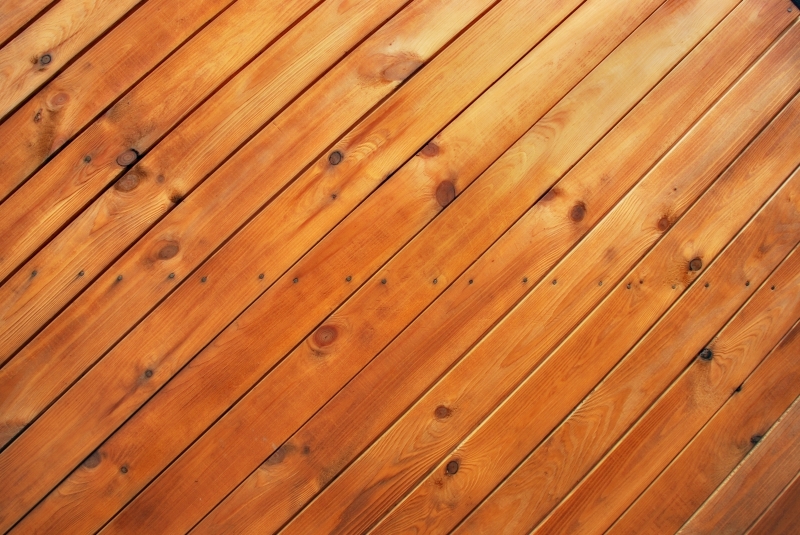 Every few years, your hardwood flooring should be refinished and stained to maintain its integrity and shine. But on a day-to-day or week-to-week basis, vacuuming or using a Swiffer is an easy way to keep it clean. It all goes back to the durability of this material, and if durability means less upkeep and cleaning, we’re all for it. Due to its durability, hardwood flooring increases your home’s value significantly. When you eventually are looking to sell your home, this becomes a talking point (and more importantly, a selling point). Not only is the value of it higher, but it is also a reassurance to potential buyers, knowing that they have a great flooring option that can serve them for years (if not centuries) to come. Hardwood flooring—it seems perfect, right? It very well might be perfect for you, but there is one drawback when it comes to hardwood versus laminate flooring. We like to think of hardwood flooring as more of an investment than anything, but as many can recognize, an investment is going to have higher upfront costs. Hardwood itself is more expensive, as is the installation cost. It makes sense, given that hardwood is more durable, valuable, and adaptable than laminate, but it will definitely cost more than laminate flooring. This is perhaps the greatest disadvantage to hardwood flooring, but you’re absolutely getting what you pay for. You have the budget to make it happen. If it’s financially possible for you to get hardwood flooring installed in your house, you probably want to go for it. For all the above reasons, it can be a great asset to the value of your home, all the while looking fabulous. You plan on being in your home for awhile. You’re building a house, or you’re renovating a fixer-upper, and you know this is going to be your home for the long run. The durability of hardwood flooring really comes into play here, making it a very practical option for your home as a whole. If you have the budget to make home renovations happen, or if you’re ready to make the jump and update the look of your house, it makes sense to have hardwood flooring become a priority. The purpose of home renovations is to create a more updated space that will add to your home’s value; to go through home renovations, only to have another form of laminate flooring installed, is not going to bring nearly as much value. Renovating and adding in laminate would somewhat be like dining at an expensive restaurant, having a pricey bill, and then not tipping accordingly because you don’t want to spend the money. You’re already investing in these costs, you might as well keep going with something that’s going to do the best job paying for itself. Hardwood flooring has many benefits to it, though we fully acknowledge that it’s not for everyone. Luckily for you, the flooring experts at The Flooring Nook can offer guidance and installation for tile, carpet, and laminate flooring as well. We’ll make sure your decisions are never hard(wood) ones. Contact our team today to get hardwood flooring!